Spring Training @ Dilworth Park - One More Week! 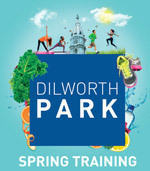 Spring Training at Dilworth Park ends April 30. Only a few more days of sports and fitness programs - everything from bocce to Zumba - all set at the gateway to historic City Hall and presented by our partner, Rothman Institute. Most programs are free, and are designed to keep you informed and in shape, right in the heart of the city. Schedule and programs subject to change. Visit DilworthPark.org for details. The Philadelphia Science Festival is back, April 24-May 2, to inspire the next generation of scientists with more than 100 events happening all over town. Highlighting how science and technology impact our daily lives, the festival features a number of hands-on, interactive events and exhibitions for science fans of all ages, including the May 2 massive street Science Carnival on the Benjamin Franklin Parkway. Best of all, most events are completely free. Art Books, Zines and More! The Philadelphia Art Book Fair is a two-day event on April 24 & 25 that features a range of exhibitors from photography and art book publishers, small and large, to individual artists and institutions. There will also be lectures from key artists and bookmakers. Presented by the Philadelphia Photo Arts Center and The Print Center. On April 30, more than 200 restaurants across the Delaware Valley will donate 33% of the night's proceeds to benefit men, women and children with HIV/AIDS. Dining Out for Life was founded in Philadelphia by ActionAIDS, and this year is celebrating its 25th Anniversary. Making a difference is as easy as going out to eat! Search for participating restaurants on the site by location, cuisine type, meal served - even for restaurants also taking part in their special 20% off Tuesday promotion. A modern day twist on the traditional supper club, Vesper is breathing new life into the former private Vesper Club. This new approach promises delicious food, classically-inspired cocktails, and live music and dancing every night. Check out the black rotary wall phone bearing the old Vesper number - PE5-7810. This phone - next to a bookcase - is a hotline to the downstairs bar. Pick up the phone and speak the password to seek admittance, and the bookcase will open as a door leading downstairs. 2015 marks the 9th Anniversary of the CANstruction® Philadelphia event to benefit Philabundance. Each year, the AIA Philadelphia Associate Committee, in conjunction with the Philadelphia Center For Architecture, invites Philadelphia’s leading design firms to participate in this unique effort to build giant sculptures out of canned goods. The cans are later donated to Philabundance, the largest hunger relief organization in the Delaware Valley. The exhibit will be on display in The Shops at Liberty Place through April 26. Sharpen your culinary talents at Williams Sonoma all month with their free technique cooking classes. April 25 is Baking Bundts at 10am. April 26 is Spring Into Action with Vitamix & Blender Girl at 2pm. May 2 is a 10am Junior Class – Brunch for Mom. All guests receive 10% off their purchase during technique classes. For more details & to reserve a spot, please call 215.545.7392.